Our Many Historic Buildings . . . . Built in 1886, it was once the Grand Ledge fire barn. In the 1940s, it was home to the city offices and, for a time, the police department. It was vacant in 1975 when the non-profit, Ledge Craft Lane, LLC moved in and began leasing from the city. In 2018, Ledge Craft Lane purchased the building from the city. Spiritualists came to Grand Ledge in 1895 to hold summer camp meetings in the woods by Sandstone Creek and the Grand River. About that year local carpenter John Rosenberger built a large pavilion to hold lectures and seance. The large open structure was much like the casino built on Third Island at about this time. The spiritualists used this camp for about fifteen years. After 1910, the camp and pavilion were home to Free Methodists summer meetings. In 1919 the City bought the property and created Riverside Park. The pavilion saw many uses, as a skating rink, dance hall, and general community meeting place. In 1943 it briefly served as the site of a factory. In 1955 the Grand Ledge Improvement Association was formed to find a new use for the building. A summer theater seemed the answer, and Dr Gordon Horrod led the effort to convert the building into a summer theater. A new floor and stage were built, and seating from the old Capital Theater in downtown Lansing was installed. In 1956 Ledge's Playhouse was born. Bill Slout from Vermontville, formed the Slout Players when he came here to open the playhouse. The Slouts left in 1961, and then the theater was used by Harold Hanson and Lael Woodbury, from Utah, for a few seasons. In 1966 John Peakes and Richard Thomsen came to Grand Ledge and formed Boarshead Theater. Boarshead used the summer theater until 1975 when they found a permanent year-round home in Lansing. After sitting empty for several years, Len Kluge and Bob Robinson formed the Spotlight Actors Workshop in 1983. Spotlight provided local summer theater to Grand Ledge until 2003. In 2006 the City leased the theatre to Kevin Burnham and Tanya Canady-Burnham who formed the Capital Theaterworks. In 2000 Spotlight theatre became worried about the condition of the old pavilion and turned to the community for help. The organization Spotlight on the Spotlight was formed (now the Ledge's Playhouse Restoration Committee) in partnership with the City, The Chamber of Commerce, Eaton County Parks Department, and the Historical Society. Fund-raising campaigns have funded the structural, electrical, painting and other repairs needed for this historic building. The current emphasis is completing the reupholstering of the chairs. Donations are gratefully accepted. A small classical jewel of a building stands in the center of town and behind it a newly renovated modern structure serves the community as a library. The history of the Grand Ledge Area District Library reflects the grassroots initiative and support of a group of women that had the courage and faith and especially the vision to launch such an enterprise. A number of attempts were made to found a public library in Grand Ledge but none were effective until the Ladies Library Association was incorporated as a permanent organization in 1911.
in 1912 the Grand Ledge City Council offered to furnish a room, light and heat if the library moved to the Water Works Building where the present Masonic Temple stands today. When a prominent banker George N. Berry donated the present site on East Jefferson Street, a great impetus was given to the building of a permanent library. In 1921 the citizens of Grand Ledge petitioned for a ballot proposal to establish a public library and provide the statutory one mill tax support to be collected, in perpetuity, and deposited in the Library Fund according to Public Act No. 164 of 1877, as amended. The voters overwhelmingly passed that ballot proposal. Twenty years after the inception of the library project, in 1931, library funds were available that were sufficient for the erection of a building. The library building was formally dedicated on Saturday, November 7, 1931. The classical style of architecture chosen for the structure was popular in the period between the World Wars. The wholly symmetrical design is enhanced with a soft green tile roof, interesting many-pane windows and formal entrance with an elliptical pediment. The brick used in the construction was from the Grand Ledge Face Brick Company, a local concern. Many have contributed generously to the Grand Ledge Public Library, but a prudent maiden-lady, Emily Shipman, who served for 49 years as assistant postmistress, stands out as a major benefactress. At her death in 1958 her estate gave over $90,000 to the library to construct the modern “new” part of the library, designed by local resident and architect, William J.H. Kane. Her estate also afforded money for major alterations in the basement of the old library, now named the Shipman Room. The most recent renovations in 2016 enlarged and updated the space. Updates include an elevator and construction of a kitchen and restrooms in the newly named 1931 Room which is in the original part of the library. 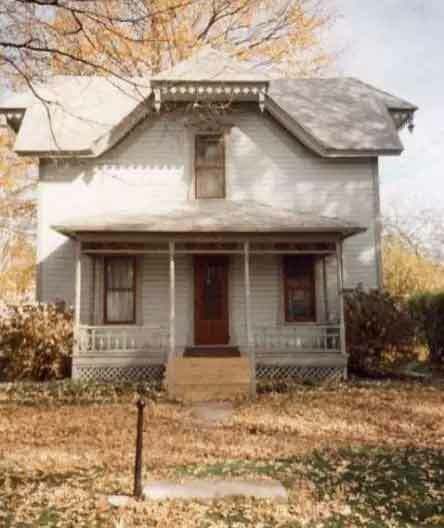 This house also known as the Pratt-Shearer cottage was built in 1880 by Byron S. Pratt, a local minister. Originally built on the corner of Lincoln and Harrison, around 1900 the home was moved to the lot next door, it’s current location. It was purchased in the 1940s by Mary Shearer where she lived for several decades. She then sold the home to the United Methodist Church. After Shearer’s death, the church rented the home until 1983 and then donated the building to the Historical Society for use as a museum. In the 1880s a roller skating craze was sweeping across the country. Capitalizing on the new sport and on the prospering Grand Ledge resort trade, J. McPeek, a Grand Ledge businessman, and Edgar Marvin, a local photographer, hired Russell F. Tinkham to build the Riverside Rink at 121 South Bridge Street in 1884. One of the first roller rinks in the area, the Riverside Rink opened on August 15, 1884. On March 12, 1885, the Grand Ledge Independent revealed Blake’s plans to convert the skating rink into an opera house. Blake commissioned Charles LaFont, a scenic artist from New York City, to construct the portable stage and scenery painted on rolls of canvas suspended from the ceiling, while Tenie Rall, a local craftsman, adorned the walls and ceiling with decorative paperhanging. With the Mackley-Salisbury Comedy Company as its featured act, Blake’s Opera House opened on May 12, 1886. Soon after buying the building, Blake bought the “Old Grange Hall” and moved it from the corner of Scott and Franklin Streets and attached it behind the new Opera House. The downstairs of the Grange was storage, while the upstairs was living space. In later years, the Opera House, now called Sackett’s Opera House was used to show early silent films as a “theatorium”. The Opera House was converted into Stephens Furniture store in 1928 and later was the home of Mapes Furniture. In 1976 the former opera house, dubbed Heritage Hall, was the Bicentennial Committee’s headquarters. In 1984 the Mapes family, donated the structure to the Grand Ledge Area Historical Society to house its growing historical collection. The Historical Society along with the Chamber of Commerce spearheaded the fundraising for the restoration. The Opera House is now governed by the Opera House Authority made up of members of the Historical Society and Chamber of Commerce Boards of Directors along with an at-large member. The building which is situated downtown on a large piece of ground along the Grand River provides a picturesque setting for weddings, receptions, and other large gatherings and community events. The Grand Hall on the main level will accommodate 240 at a sit-down dinner. The main floor also houses an antique Barton Theater organ which was originally used in the Michigan Theater in Lansing and lovingly restored by the Lansing Theatre Organ Guild. The Terrace Level accommodates 140. There are catering kitchens on both levels. The table in the Blake Room is thought to have been made by a Grand Rapids furniture company. It was made especially for the Grand Ledge branch of the Michigan National Bank when they bought out both of the local Loan & Deposit and Grand Ledge State Banks and build the new bank on the south east corner of Bridge & Jefferson. It was made for their Board of Directors' room on the second floor facing the N.W. corner of the building.When Michigan National Bank closed downtown and moved out to Saginaw Hwy., Terry Smith, Lorabeth Fitzgerald and Walt Eschtruth who were on the Michigan National Bank board of directors and involved with the renovation of the Opera House were offered the table. Michigan National held the mortgage on the Opera House when it was offered to the Opera House Board for the Opera House, so they thought the Blake Room would be its perfect home. When you visit the Blake Room, you will agree!